Which Trump family member or crony will get it? Ever the greedy businessman, Donald Trump looks for opportunities to profit anywhere and everywhere imaginable. 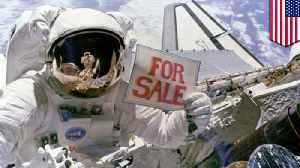 His latest profiteering scheme is to privatize the International Space Station. His 2019 budget proposal includes $150 million to do this, and an additional $900 million in 2020. The Very Stable Genius seems to think that this will enable our space program to move forward more quickly than NASA currently can. What will become of NASA and other governments’ space agencies, though? Why, they’d become “customers” of the station, along with everyone else wanting access. You can imagine how much he might want to charge, especially for non-U.S. groups. It’s not nearly as easy as he seems to think because we’d need to draw up new agreements with our international partners for turning it into a private, for-profit enterprise. The Con-Man-in-Chief’s plan doesn’t have any details about how this would work in practice, let alone how we’d go about it. It’s just like Trump to try and push something through as quickly as possible, behaving like it’s the easiest thing in the world to do. Private space travel companies like Space X are barely off the ground (pun intended) right now, and Trump wants this done by 2025. It’s true that a private space station could mean NASA could focus on other aspects of space travel, like going back to the moon and going to Mars, but we have to ease into this far more slowly than Trump wants. You have to wonder whether he sees a way to personally profit from such an endeavor, because that’s Trump’s primary goal. Profit by any means possible. Author Rika Christensen is an experienced writer and loves debating politics. Engage with her and see more of her work by following her on Facebookand Twitter.